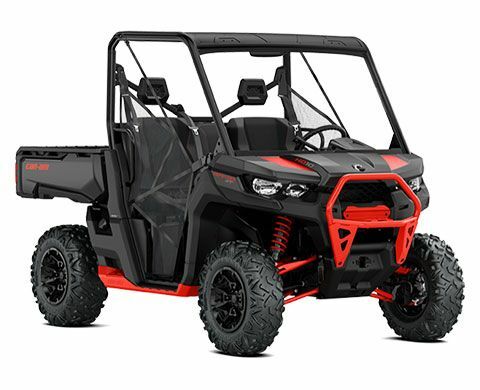 The next step in Defender performance is here, with the Rotax HD10 V-Twin engine powering an upgraded FOX PODIUM suspension and numerous interior and exterior upgrades that have been factory-fitted to extend its capabilities even further. ROTAX HD10 V-TWIN: In the Defender XT-P, the 72 hp Rotax HD10 V-Twin is still specifically tuned for serious work, but gains more responsive tuning for active, sport-oriented riding. The Defender can do that sort of riding, too, but how? Torque. RIGID CHASSIS: The Defender is an extremely capable off-road vehicle and a legitimate workhorse that uses a chassis with automotive-like technology and fabrication tolerances that are in line with modern pick-up trucks. The high-strength, low-alloy (HSLA) grade steel means a more rigid design for taking the strain of heavy-duty chores. Can-Am engineers put the Defender frame through the new rigorous Utility Test Cycle at the winter and summer testing grounds to ensure its toughness. HANDLING: Delivering the responsive, thrilling feel of an enthusiast-oriented machine is a Can-Am thing. It's been in our DNA from the beginning, in fact, which is why the XT-P has been retuned to return even higher levels of enjoyment when out on the trail. WORK / ECO / NORMAL DRIVING MODES: With the power of the Rotax HD10 at your back, there's different ways to use all of it. Work, ECO, and Normal driving modes help drivers maximize response depending on their needs. For instance, Work prioritizes low-down control and response, key for towing, hauling, and maneuvering with ease. FOX 2.0 PODIUM SHOCKS: FOX Racing makes the ultimate in off-road suspension, and for the first time, its 2.0 PODIUM shocks have been fitted to a factory Defender. Now with 12 in. (30.5 cm) of ground clearance and increased responsiveness and durability in rough terrain, they're a serious upgrade for our work-grade side-by-side vehicle. VERSA-PRO BENCH SEAT WITH BOLSTER SEATS: For a more recreational ride, our engineers quickly learned that bolstering the Defender's capability meant its occupants needed more seats support than ever, leading to the all-new adjustable VERSA-PRO bench seats. With added side padding and redesigned profile, they'll help you control and enjoy this side-by-side vehicle to the fullest. CARGO BOX: The highly durable, easy-to-dump cargo area is the box you wish your truck had. Strategic features include 5 gal. (18.9 l) pail recesses, integrated anchors on the sidewalls and several tie-down points for added convenience. To fully optimize the sizeable cargo box, consumers can divide up the box using the integrated recesses. The box allows for both 1x3 and plywood separators and accepts bed extenders for refining the bed’s overall dimensions. Also, the sturdy tailgate can withstand ordinary farm use and serve as a seat during your lunch break (max weight: 250 lb / 113kg). ALUMINUM ROCK SLIDERS: Sliders protect the sides and undercarriage against large obstacles, and the Defender XT-P is rocking a pair of Heavy Duty aluminum rock slider and an integrated step for elevated cargo box access.